This is my favorite vegetable curry - it's quick to cook, relying on bought korma paste. With protein from the lentils and spinach, it's a great balanced meal. I love the surprising crunch of the mustard seeds (Jane). The vegetables - on hand for most of us most of the time. 2. Add pumpkin, lentils and stock or water (I use water) and bring to boil, simmer for about five minutes. 3. Add cauliflower simmer for about 10 minutes until pumpkin is just tender. 4. 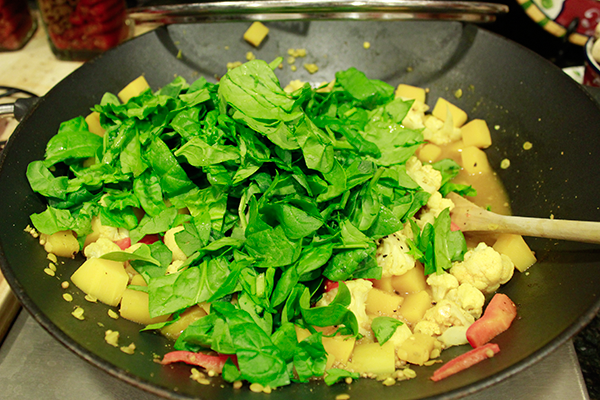 Add cream (or coconut milk) and spinach - and stir until spinach just wilts. The spinach will just about disappear - so don't be worried if you think it is too much! 5. Don't forget to have your rice ready - if you are using brown rice you'll need to get it started first. 7. Add optional ingredients to taste - sambal oelek, fish sauce, lemon juice, salt and pepper to taste. 8. Garnish with chopped cilantro/coriander and serve over rice and with Naan bread. Credit for this recipe goes to Peter who first found it in the pages of a Women's Weekly cook book and it's really one of his signature dishes.